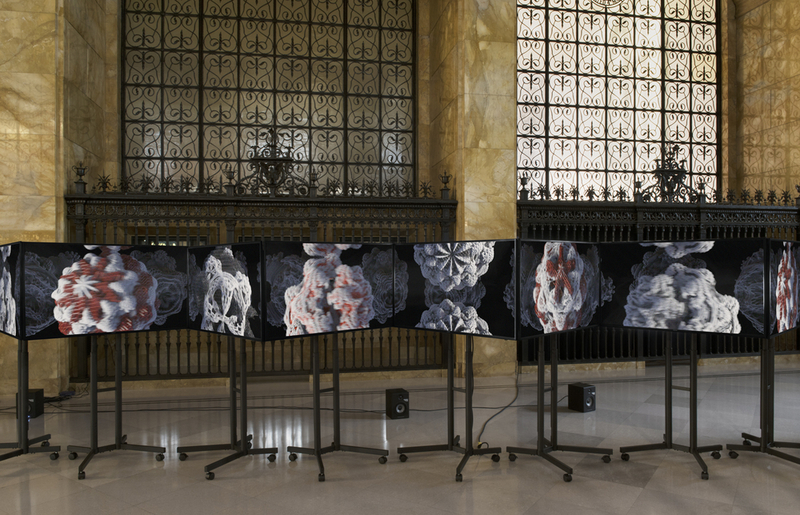 The expressed goal of the inaugural FRONT International: Cleveland Triennial for Contemporary Art is to shine a spotlight on the cultural landscape of Cleveland, a city many might overlook when thinking of art hubs. 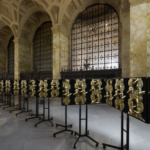 The organizers of FRONT, of which there are many, are taking their chances on yet another triennial/biennial event but are decidedly not relying on a market-based model, like Art Basel or the closer Expo Chicago. In doing so the city is hoping to set itself apart and focus on the cultural aspects of the art, rather than the scene of art culture. The first thing that will strike visitors to FRONT is its scope. With this year’s theme, An American City: Eleven Cultural Exercises, it can honestly be said that the show spans much of the city, including dipping its toes into Lake Erie. 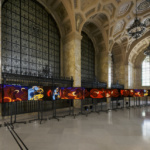 With no single institution claiming the show as its own, each of the city’s major art museums and a number of galleries and universities have worked in unison to produce the encompassing show. 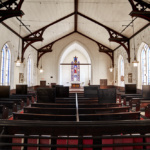 It is a credit to Curator Lisa Kurzner, Artistic Director Michelle Grabner, Executive Director Fred Bidwell, and their team that such a complex undertaking could be negotiated. Public spaces and government buildings also get in on the act with massive new murals, large-scale sculptures, and a number of temporary installations. 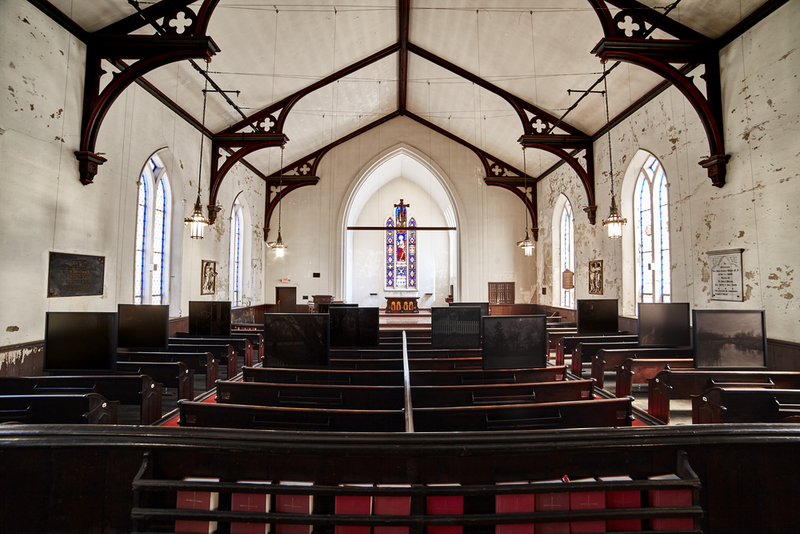 In many ways, these pieces, outside of typical presentation settings, are the most striking. Possibly the least expected of the non-traditional spaces to show art is the Federal Reserve Bank of Cleveland. 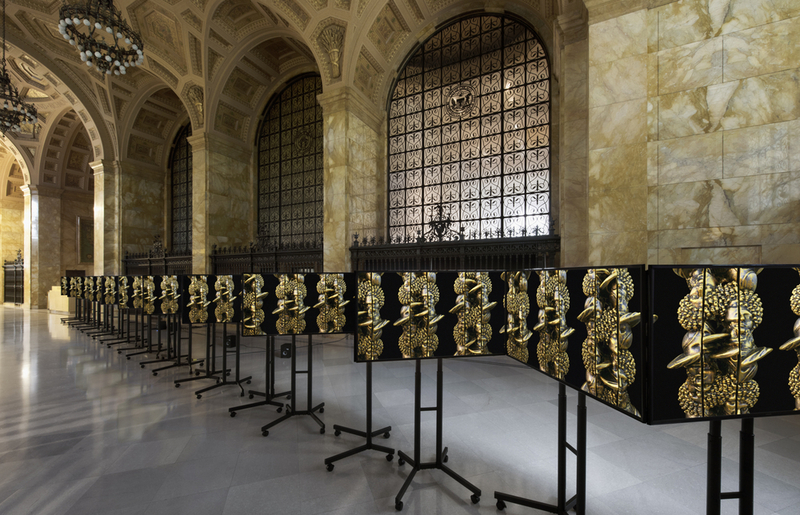 Completed in 1923, and fully adorned in ornate gold and marble details, the lobby of the bank is home to a mesmerizing video and sound installation entitled Volatility Smile by New York-based Midwest-native Philip Vanderhyden. 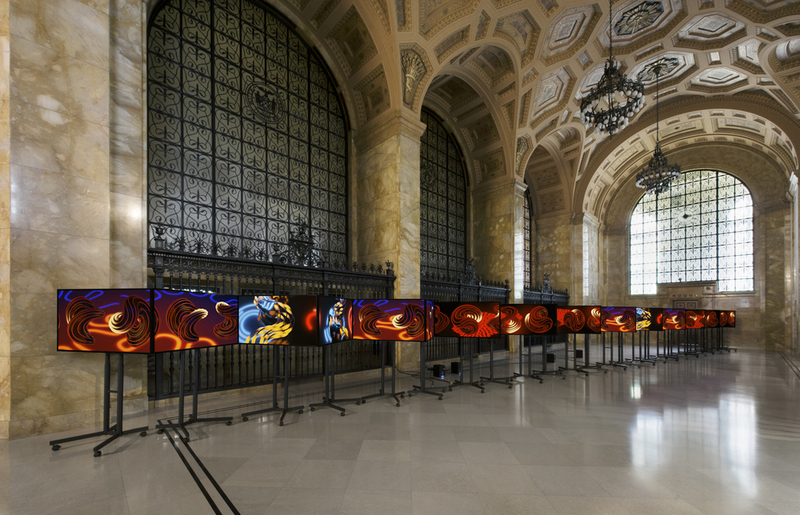 The 24-channel video of digitally rendered abstract forms plays with imagery pulled directly from the space itself. 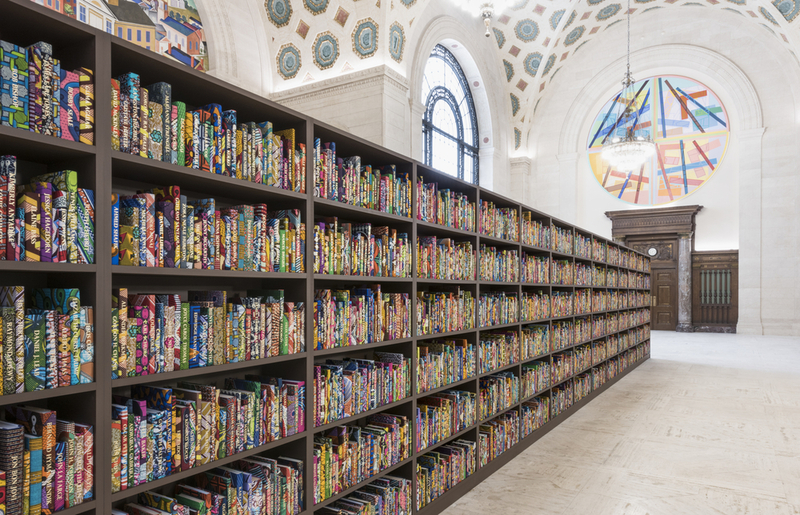 A similarly poignant installation fills the large gallery of the downtown Cleveland Public Library. 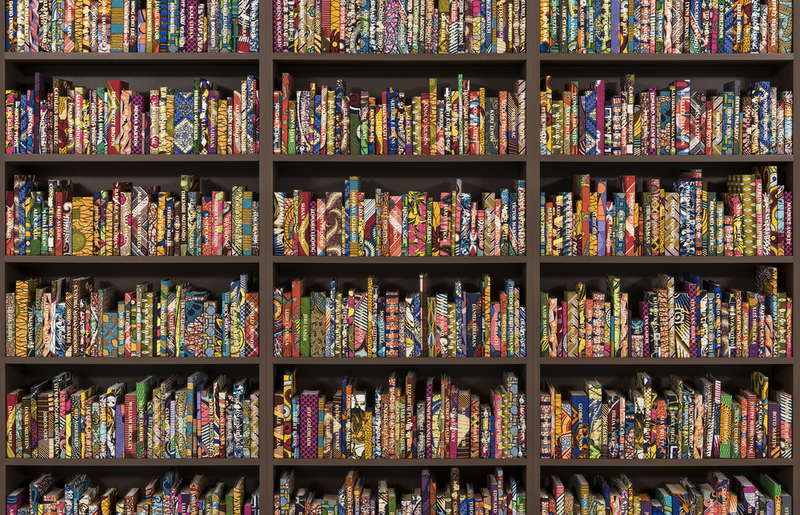 The American Library continues Yinka Shonibare’s research-based cultural art practice. 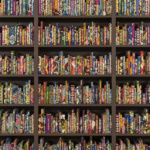 The piece is composed of thousands of books covered in African cloth and embossed with the names of American immigrants. The bright color and context of the piece make accessible the timely content, which builds on Shonibare’s work dealing with post-colonialism around the world. The work within the established art museums and galleries is broad-ranging and varied, and many pieces are not to be missed. At Case Western University and MOCA Cleveland, a giant silver hand by sculptor Tony Tasset welcomes guests to the museum and the university, both of which are also participating in FRONT. 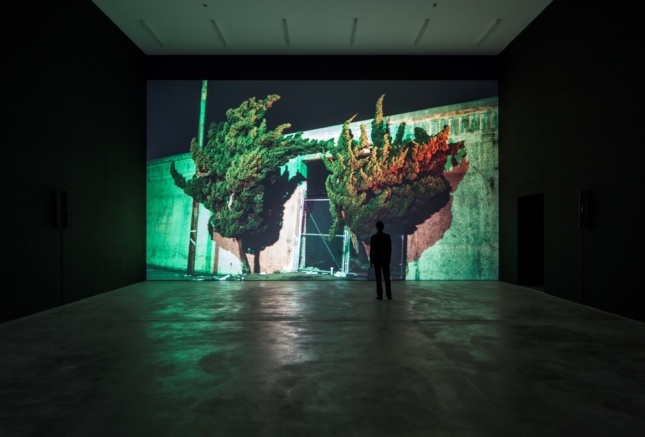 The inside of the Farshid Moussavi-designed MOCA Cleveland echoes with the soundtrack of Cyprien Gaillard’s Nightlife, a slow-motion 3-D video installation of animated urban plant life. It is as intoxicatingly beautiful as it is hypnotizing. Equally powerful, if not much quieter, is what may be the hidden gem of the entire exhibition. 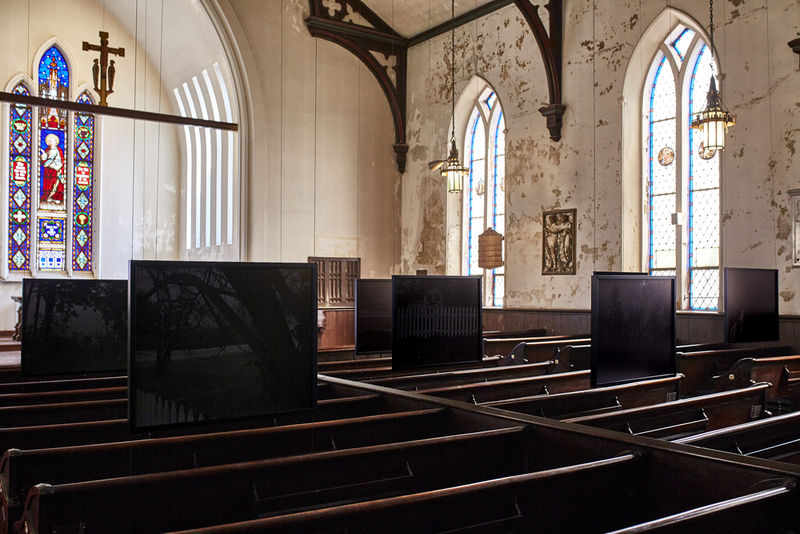 Located in the oldest church in Cleveland along a quiet street, Night Coming Tenderly, Black by photographer Dawoud Bey exemplifies the type of work that FRONT is aiming to promote. 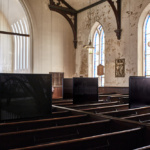 Both regionally specific and universally accessible, the large installation fills the pews of St. John’s Episcopal Church with almost completely black images depicting landscapes that escaped slaves traveling the Underground Railroad would have encountered. Appropriately, the church itself was the final stop along the perilous system of safe heavens before escapees crossed Lake Erie into Canada. 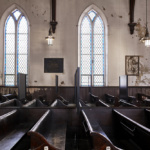 The placement of the large-scale prints in the pews allows for viewers to sit unusually close to the images, making them incredibly immersive as one studies their intense shadowy detail. In many ways, FRONT International has set itself up to achieve its goal of bringing the world to Cleveland. 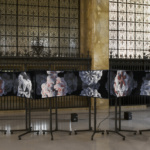 The array of work is a testament to the cooperation between institutions, which would seem unlikely to happen in the more competitive art scenes of larger cities. 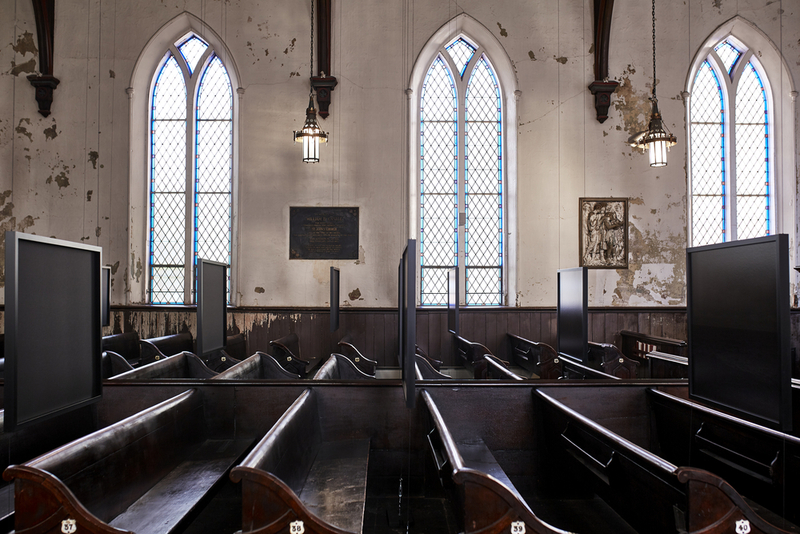 The work is often both specific to Cleveland as well as relevant to outsiders. Taken in all together, the show is exciting and shows the potential when a city like Cleveland puts on an international exhibition. Does the world need another art festival? Perhaps not, but if we are going to get one, Cleveland seems to have figured out a way to make it worthwhile.